On this episode of The Addicted Mind podcast, our guest is Suzie Wolfer, LCSW, SEP a therapist specializing in Somatic Experiencing®, a powerful system of healing trauma and addiction at it’s core and for completing trauma, so that it’s let go of you. Somatic means “of the body,” which includes the sensations we feel when we experience different emotions and thoughts. Trauma and stress are stored in the body, causing behaviors, patterns or responses arising from implicit memory system or the unconscious. Our initial reaction to the uncomfortable feelings that are associated with trauma and stress is to stabilize these feelings by managing them from the “top down,” striving to suppress, control, or make the feelings go away. This desire to manage troubling thoughts and emotions, though useful in the short term, keeps us from healing the underlying stuck patterns, that show up as chronic Fight, Flight or Freeze behaviors or a combination of these. With somatic therapy, we help your body remember how to complete stuck Fight, Flight or Freeze patterns We call this re-negotiation. Instead of trying to get rid of scary, infuriating or numbing feelings and thoughts, you learn to watch them, especially in how your body expresses them. Imagine a roller coaster. It can be scary and exhilarating to feel the car taking you up, up, up to tower over the precipice, wondering if the little wheels will keep you safely on the rails. Challenging emotions, even pleasure, can start to feel scary, and it’s easy to use substances or compulsive behaviors to try to manage or out run the sense of threat they pose, of “going off the rails.” The closer we get to the top of the roller coaster, the more energy builds inside us, including excitement. When you are able to observe what’s happening inside, especially observe your body sensations associated with thoughts and emotions, these emotional messengers can deliver their message and let go of you. When that happens, like when the roller coaster car comes back to the platform, you may feel a good feeling, a smile on your face, as you get off on level ground and go on to the next thing. Maybe even a little more confident in your ability to face challenges! 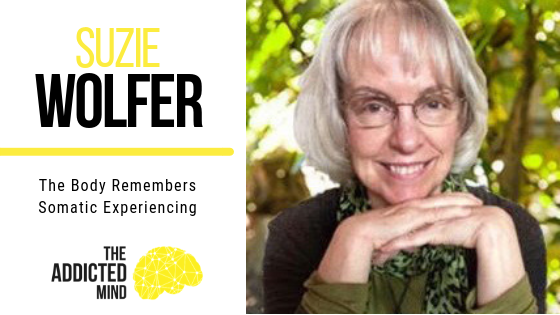 In the past decade of supporting her patients with Somatic Experiencing® Therapy, Suzie has found that this gentle approach helps people not only feel better, but get better, a little at a time, and in every session. Rather than just talking about issues and understanding them, an important first step in the healing process, using the body’s built-in system for “self-regulation” helps patients feel Ease and Confidence, as the backlog of accumulated stress, lets go of them, from inside out. They feel lighter and more alive as they experience the reliable nature of things on his planet, that all experiences having a beginning, middle and end, a beginning, middle and end. When clients experience this natural cycle, they often take a deep spontaneous breath, their body relaxes and their face brightens with more aliveness. Like a caboose on a train, the thinking process is sometimes the last to know! Are you safe? Yes or no. Notice that feeling safe and being safe in this moment are two different things. Using your 5 senses, notice signals or data are you getting from the world outside you, which confirm that you are safe. What are these signals? Next, notice what happens in your body when you confirm that you are safe in this moment. Perhaps savor what you discover. Audible is great way to listen to books on the go. I love it and have been a subscriber for over two years. Sign up today and your subscription can also support The Addicted Mind podcast. Thanks! 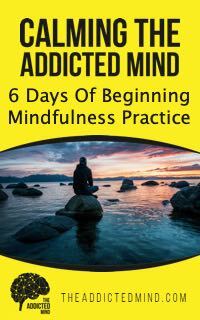 Yes, add me to the newsletter & sign me up for the FREE 6 Days of Beginning Mindfulness email series.